MOSCOW, January 29. /TASS/. Moscow is concerned over armed clashes between those supporting the independence of South Yemen and government troops in the city of Aden, the Russian Foreign Ministry said in a statement on Monday, adding that Moscow was ready to help broker talks between the parties. "Moscow is concerned over these developments, which may lead to a new round of military activities in Yemen and expand the circle of participants," the statement reads. "We still believe that the future of Yemen, including the issues concerning its political and administrative system, should be resolved not through military means but at the negotiating table after the military conflict is over, while the interests and concerns of all the leading political forces in the country should be taken into consideration," the Russian Foreign Ministry added. "On its part, Russia will continue to facilitate the process," the statement adds. The Rudaw TV channel said earlier citing the Yemeni Health Ministry, that the recent clashes had claimed the lives of 12 people, while more than 130 had suffered wounds. The war between Yemen’s government, recognized by the global community, and the Houthi rebels has been raging since August 2014. 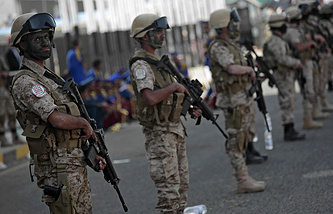 The conflict entered an active phase when a Saudi-led coalition invaded the country. Saudi Arabia, supported by the air forces of Bahrain, Qatar, Kuwait and the United Arab Emirates, is involved in a military operation against the rebels. Egypt, Jordan, Morocco and Sudan are also part of the coalition. Tensions rose on November 29, 2017, when fierce fighting broke out in the country’s capital of Sana’a, fueled by the Houthis’ attempts to seize a number of facilities controlled by supporters of former Yemeni President Ali Abdullah Saleh. On December 2, the ex-president renounced his alliance with the Houthis and was killed by rebels on December 4.